Colder conditions but rain badly needed. Well a shock to the system this morning with -3 conditions here in Taupo this morning. I have been lucky enough to sneak of to Tasmania and Melbourne for the past couple of weeks and this is the reason behind the lack of reports lately. It seems I have not missed all that much in the way of work or in the way of trout in the rivers as fishing pressure hasÂ been really low. Rivers seem to be low and clear which would have opened up plenty of opportunities to fisherman but they could really do with a bit of rain to get fish moving again. 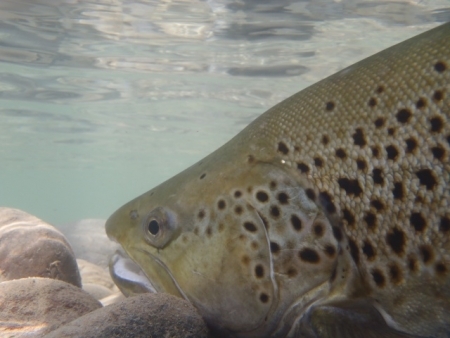 We had a very good start to the season with good fish running the smaller rivers early as they would usually do and also some good pods of trout entering the Tongariro. TheÂ early fish which ran the rivers were in great condition and a good size with some fish pushing well over 5lbs which isÂ great news. I have a feeling that these fish are still trickling through with the colder conditions but with the lack of fisherman they are getting through without anyone knowing. Fewer anglers on the river means you can get your best or favourite water which in my opinion will always find fish eventually. The Tongariro is one of those places which moving about is the best thing to do and once you find one or two fish you will generally find more. Before I left I had some good fish with clients by using the good old wetline. Wet lining flies such as Woolly Buggers and Red Setters can be lethal in the right water. When I say the right water I mean deep quite stiff currents which have structure for trout to hold up in such as boulders or undercut banks. New Zealand rivers are full of boulders and undercut banks so I think you will all identify this water perfectly just be careful on the sink rates of thoseÂ sinking lines. I see that the dozers are still pulling gravel and rock out of the lower river which after the next flood should leave some good pools or holding runs. At the moment the disturbance of gravel and sand washing down the river from the effects of this movement will be doing nothing for encouraging new trout into the river, I hope it soon stops but I wont hold my breath. Over the past six months those of you who visit the Taupo fishery often will have seem alot of man made changes on our rivers which can beÂ debated if they are good or bad. The rock and gravel extraction is aÂ biggy on the Tongariro as is the work done in the lower Hine with the removal ofÂ Willow trees on what I used to all the swinging bend. I think this was altered due to the river cutting into the bank too muchÂ which in the end may have cut through to the village-fair enough. Today I fishedÂ quickly in theÂ lower Hine just to see what was happening or changed etc as I have clients coming up soon. I was disappointed to find once again the magician with the saw had been down there and cut out over hanging branches. Whoever is removing these obstructions is obviously a fisherman which cant cast or scared of loosing a few flies. What he or she has actually done is removed the cover which fishÂ hang under and by removing them the holding water has now changed and they wont stop there any longer. There have been Willow branches removed, flax pulled out and tracks cleared- come on mate leave it alone and learn to fish round the foliage and not in it! !